PriceWaterhouse: Tell us, what you want it to be? I guess the credibility of Price WaterHouse has come down really badly after the Satyam Scandal. I have edited the collection. (Some questions were deleted as they were based on current affairs during that time). Thanks to Mr Arindam for sending in the questions. Also, most of the questions were supplemented by hints and clues by the quizmaster. When Neville Cardus described the phenomenon as ‘snicket’ or ‘slogget’, what was he referring to? Which West Indian great’s autobiography is called “The Man in the Middle”? One more quote: About which great left-hander batsman did Don Bradman remark, “If you score a century like that again, I hope I’ll be there to see it”? Which was the first cricket stadium in India to have floodlights? Who was the first Indian bowler to take five wickets twice in One-Day Internationals? Which cricketer was in the same car with Jagit Singh’s only son Vivek Singh when they met with an accident and the latter died? This Kiwi batsman was dismissed in the very first ball of a One day cricket World Cup, the only one to have been done so. Can you name the batsman? Can you name Vinod Kambli’s debut film? Who used to keep wickets for South Africa in the 1996 Cricket World Cup? Which cricketer was given the nickname “Rent-A-Wagon” by the legendary English commentator Brian Johnston, since he could not pronounce his real name? What connects Sourav Ganguly, Farokh Engineer and Clive Lloyd concerning their international first class cricket career? Who is the only Indian to win a World cup cricket (any category) as a player and a coach? Brett Lee was threatened to be taken to court by the Kiwi coach John Bracewell for bowling successive beamers at which contemporary batsman? The first reported allegations about the match fixing can be traced back to the Pakistan-West Indies test match played between February 15-20, 1975. Clive Lloyd was the West Indian captain. Who led the Pakistan squad? Who headed the first Indian commission of inquiry into the allegations of match fixing against Indian players? Who is missing in the series: Hansie Cronje, Herschelle Gibbs, Nicky Boje, Pieter Strydom, ____________? Which Indian cricketer’s autobiography is called “Spin Punch”? In the famous Lord’s test of 1974, India crashed to 42 all out, who was the only batsman with double figures in that infamous innings? What nickname connects Ken Rosewell with Venkatpathy Raju? This former English captain is a Kent legend. He captained the English cricket team during the 1975 world cup and Brian Luckhurst was one of his country opening partners. Who? Which Zimbabwe cricketer had his nose broken by an Irfan Pathan bouncer and his other claim to fame includes being jailed for arson and violence and later sent for counselling? Which Australian made his debut in 1994 in the Australasia cap as a wicketkeeper? How was Cricket Australia personnel Phil Jauncey in news? What is the exact position of Dave Whatmore in the current Indian cricketing system? At the ICC Awards held on September 11, 2008 what honour was given to Ryan ten Doeschate? Ans: The Dutchman was declared as the Associate Player of the Year. Which Indian cricketing international and domestic legend are currently Bengal Ranji trophy team’s consultant and coach respectively? Complete the list: Marvan Atapattu, Russel Arnold, Upul Chandana, Avishka Gunawardene and ___________. Which two Indian cricketing legends’ autobiographies are called “Cricket Delightful” and “A Long Innings” respectively? Chaminda Vaas has taken 400 one day wickets. Which one-day legend wrapped up his career with 393 wickets? He has taken 32 wickets in test cricket. In the 1999 World Cup in England during India’s last league match against England, who took the crucial wicket of Neil Fairbrother? One more from the same World Cup. Which batsman scored a half century in the famous league match of India against Zimbabwe in 1999 World Cup. India had lost that match. In the famous Natwest trophy final which India won against England, Virender Sehwag hit 4 consecutive fours in an over. Which bowler from England was the sufferer? Which former Indian test player was born in Rio de Janeiro? He was India one of the finest domestic crickets and held an international first class cricket batting record for the last wicket partnership. Amongst his other non-cricketing specializations, he was a fingerprint expert. Can you name the legend? Apart from being former cricketer and a cricket coach, what is the professional expertise of Geoff Lawson? What connects: Bal Thackeray, Arthur Mailey and OV Vijayan? Which cricketing legend had a restaurant called “Banana Leaves” that was washed away by the tsunami? What is common to – scut of rabbit, brush of a fox, wreath of a boar, stern of a wolf and a cricketing position? What connects Timex, Acestar-underwear range and Manmohan Shetty’s film Victory? Sachin Tendulkar’s first world record was for his school Sharadashram Vidyamandir in a school cricket tournament in Mumbai. Which tournament? Who scored a brilliant century for Bangladesh making his team win a historic one day match against Australia in the Natwest Trophy-2005? Who was the Indian cricketer to endorse Brylcreem? Which is the only father and son pair to represent the same country in the ODI World Cup? Who has the distinction of playing the maximum number of Test matches without being a captain? I was not out when Kumble took all ten wickets in an innings. Who am I? One of the finest cricket contemporary cricket authors, he is currently a resident of Sri Lanka. He is a New Zealand born cricket aficionado who has been a first class umpire and a cricket writer since 1958. Can you name the journalist? Which company brings out the magazine Cricket Today? Sachin Tendulkar could have been the youngest ever test centurion when he was caught off the bowling of Danny Morrison at Napier during the India- New Zealand test series early in the master blaster’s career. Who took the catch? If Michael Holding was known as “Whispering Death”, who is known as the “Slow Death”? Who gave Kapil Dev the nickname “Haryana Hurricane”? He began his first class career for his native state Otago and almost ended with Worcestershire. In between, he became a cricketing legend both in Test and one-day and recorded his highest score of 311 against Warwickshire at New Road in 1982. He has an Indian connection. Name the great. Amongst the world records made in 2008, has been 12 sixes by a player against Canada during his unbeaten 157-run knock at Maple Leaf North West Ground, King City on August 22. It broke the joint record held by Sanath Jayasuriya and Shahid Afridi. Can you name the player? In the famous match of the Australasia Cup where Javed Miandad recorded the last ball six off Chetan Sharma, who was the Pakistani wicketkeeper in the game? Which Indian cricketing legend was born in Kabul? Who is the current Chief Operating Officer for PCB? Which was the one-day cricket tournament when the Supreme Court of India had its first brush with the cricket broadcasting rights? What does TEN stands for in “TEN Sports”? P.S Stay tuned as more posts are due 🙂 Also, incidentally, this is the 42nd post on the blog. Q1. The first school of economics in the modern world was led by Francois Quesnay, the writer of La Tableau Economique. How was this group of economists better known? Q2. Ragnar Frisch was the first winner of the Nobel Prize for Economics. For his study in which field did he win the Nobel Prize? Q3. The UBS is a financial institution belonging to which country? Q4. India’s nuclear tests in the 1970s led to the formation of the Nuclear Suppliers’ Group. Which organization was formed due to the oil crisis of the 1970s? Q5. Which car company manufactured the ‘Beetle’, the Peoples’ car, on orders by Adolf Hitler? Q6. The Titanic was the largest ship of its time. Which is currently the largest commercial passenger ship in the world? Q7. Which building houses the Bombay Stock Exchange (BSE)? Q8. WIPRO, one of India’s largest IT companies is also an FMCG player. With what business did WIPRO begin? Q9. The winner of the 2008 Nobel Prize for Economics teaches at which famous university? Q10. Karl Marx was expelled from Germany for his communist viewpoint. In which country did Karl Marx find shelter and write his Das Capital? Q11. The rupee is the currency of India and Pakistan among several other South Asian countries. Of which country is the Rupiah the currency? Q12. The world’s largest company, Exxon-Mobil was formed by the merger of Exxon Corp. and Mobil Corp., both petrochem majors. Their common ancestor, The Standard Oil Company, was owned by the richest man of all times. Identify him. Q13. Who was the person with highest visibility, in terms of minutes, in television advertisements, as confirmed by a recent report? Q14. With regard to Hollywood, which is the highest grossing film of all times (adjusted for inflation)? Q15. With regard to which car did Henry Ford say “People can buy any colour as they wish to, as long as it is black” ? Q16. Which of the following was not a part of the four pillars of Wall Street? Q17. The first stocks in the world were issued for which company? (a) The British East India Co. (c) The Dutch East India Co.
(b) The French East India Co. (d) The Portuguese East India Co.
Q18. Which is the only car to have briefly replaced a Maruti Suzuki car as the largest selling car in India ever since the Maruti 800 was introduced? Q19. Who presented the first Budget of Independent India? Q20. To overcome the Great Depression, Franklin Delano Roosevelt introduced which policy? Q21. In 1988, Ajjay B. joined his family business, the Amritsar Transport Corporation. Alongside ATC, his family ran another business, which was doing abysmally. Ajjay’s father gave him Rs.40 lakhs to turnaround the business, which he managed to do in two year’s time. To expand his business, he formed a JV with an Australian company. What was the name of the JV (give the full name)? Q22. What connects the following CEOs – Time Taft of Pizza Inn, Eric Schmidt of Google and Steve Jobs of Apple? Q23. An Indian product, whose, SI prefix meaning 109, a term coined by physist Richard Feynman. Name it. Q24. Name of which business legend name means, “prosperous rice field” in the local language? Q25. Who is the world’s first Chief Happiness Officer? Q26. Ashok Todi, father-in-law of the hapless Rizwanur Rehman, owns this brand worth Rs.200 crore. Interestingly, Bengalis had voluntarily chosen to shun the product after Rizwanur’s death. Name the brand. Q27. Which country’s central bank has misspelt the word “bank” on its new notes as “bankh”? Q28. Who said this – “the five most dangerous words in business may be – everyone else is doing it”? Q29. By what name is “Jerry’s Guide to the World Wide Web” now know? Q30. X ($ infinite, 1600 plus yrs), Richie Rich ( $ 24.7 billion 12 yrs), Oliver Warbucks (10 billion, 57 yrs), Scrooge McDuck ($ 8.2 billion, 67 yrs), Thurston Howell III (8 billion, 45 yrs) are the five richest fictional characters of all time. Identify X.
Q31. Who is the lady who left her property of 5000 crore to her C.A? Q32. There are many companies which love to hate Microsoft. The principal enemies of Microsoft are commonly referred to as NOISE (netscape, oracle, IBM, Sun Microsystems and E). What does E stand for? Q33. What is the name of Walt Disney’s first animation film for the Indian market? Q34. Name the first Indian woman to graduate from Harvard and the company headed by her. Q35. What does “R” in Maruti Suzuki’s small car Wagon R stand for? Q36. Which industrial house has pledged to maintain the Taj Mahal? Q37. Who is the lifelong chairman of the institute on rural management, Anand? Q38. Which famous economist who has produced pioneering studies on gender inequality, has always taken care to write “her” rather than “him” while referring to an abstract person? Q39. Which was the first Indian company to ring the NASDAQ opening bell from India by a remote control? Q40. What do you mean by ‘banglored’? Ans17. (c) The Dutch East India Co.
Scores of Top 6 teams – Only the top 4 Qualified! This was the Business/Economics Quiz held at DPS, RK Puram – We won this Quiz, and performed really well, topping both the prelims and finals. This was a great quiz, really lived up to my expectations – There are not many Biz Quizzes in school fests, but this one was organised really well. 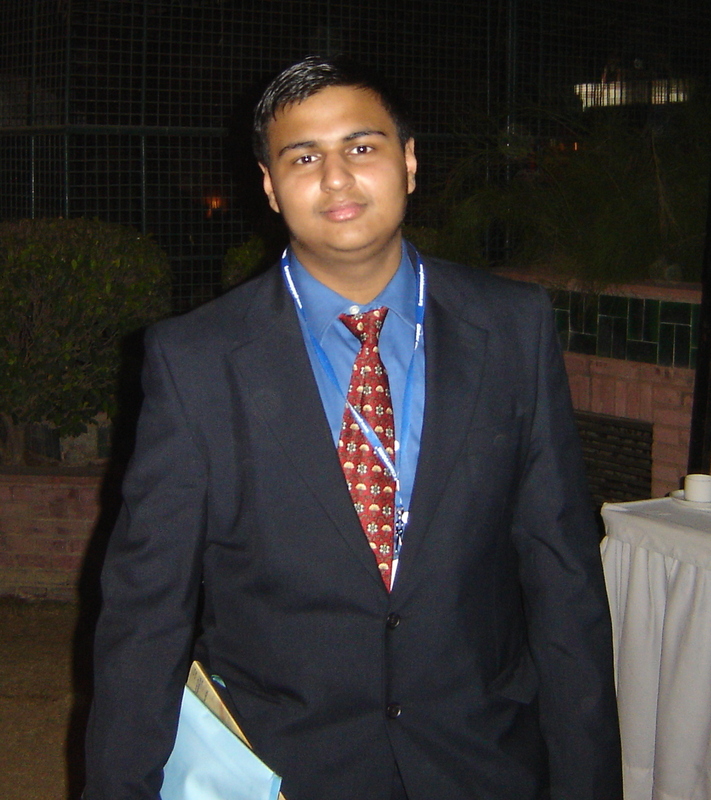 You can read more abt Econorm 2008 here (By Subhashish Bhadra, the quizmaster) Kudos to the Econox Club for this one! Would definitely come back next year and I hope schools organise more such quizzes and events. 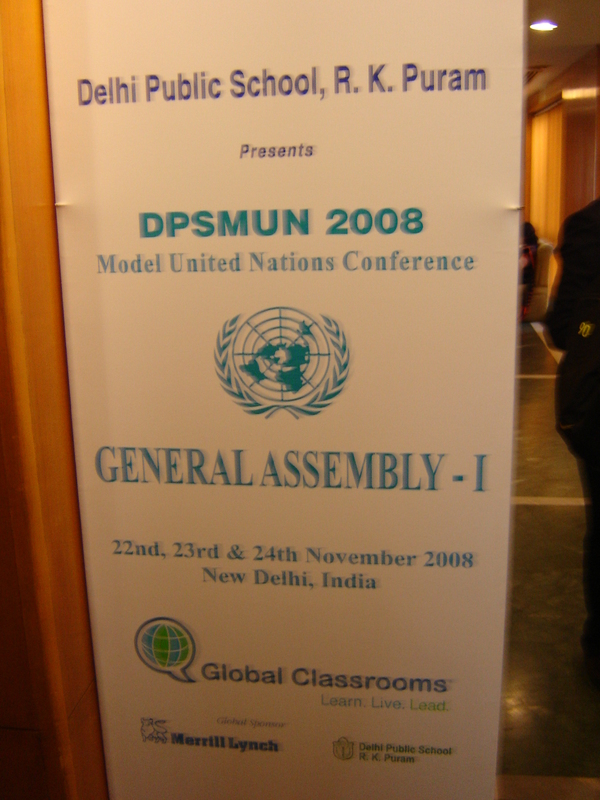 DPSMUN is an annual Model United Nations (MUN) conference organised by DPS RK Puram alongwith Global Classrooms. 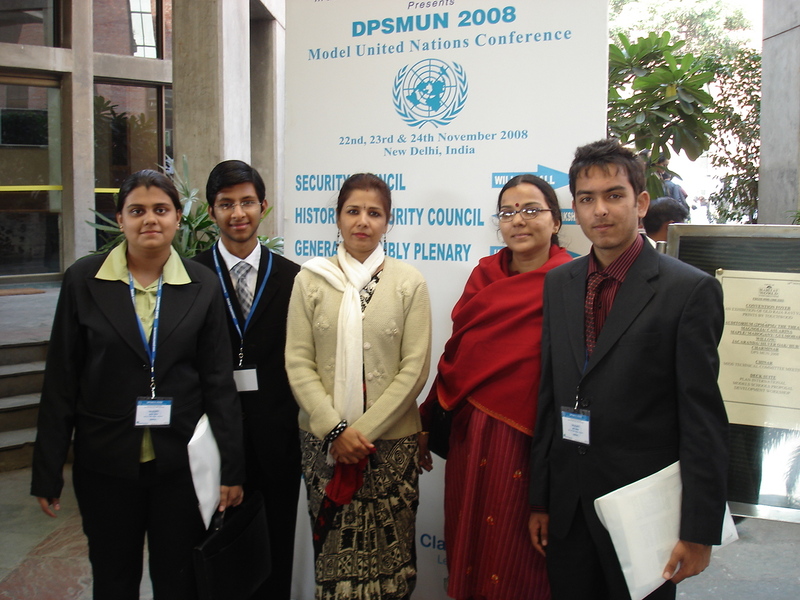 2008 was the 5th edition of DPSMUN. You can read more about MUN here. This year it was held on 22-24 November at the India Habitat Centre, Lodhi Road. So we got the invitation around July and then the Social Sciences HOD started selection for the team. She got in some interested students and gave them topics to prepare on. We kept delaying things, and finally the selection was done around September. So this event is basically a MUN conference (To know, what exactly is an MUN, head here). I had heard a lot about this but was not sure whether our school would be participating in it – I was also quite ignorant of this event till Class X, but finally my Political Science teacher told me all about this (Our school had gone for this some years back). I was slightly apprehensive at first about going, because this event needs a lot of hard work, research and good communication, speechmaking, writing and PR skills. But then I finally decided to go for it. We have to fill in choices as to which country we want (to represent), we filled the form for 2 countries but finally got only one (that too, not the one which we had asked for). 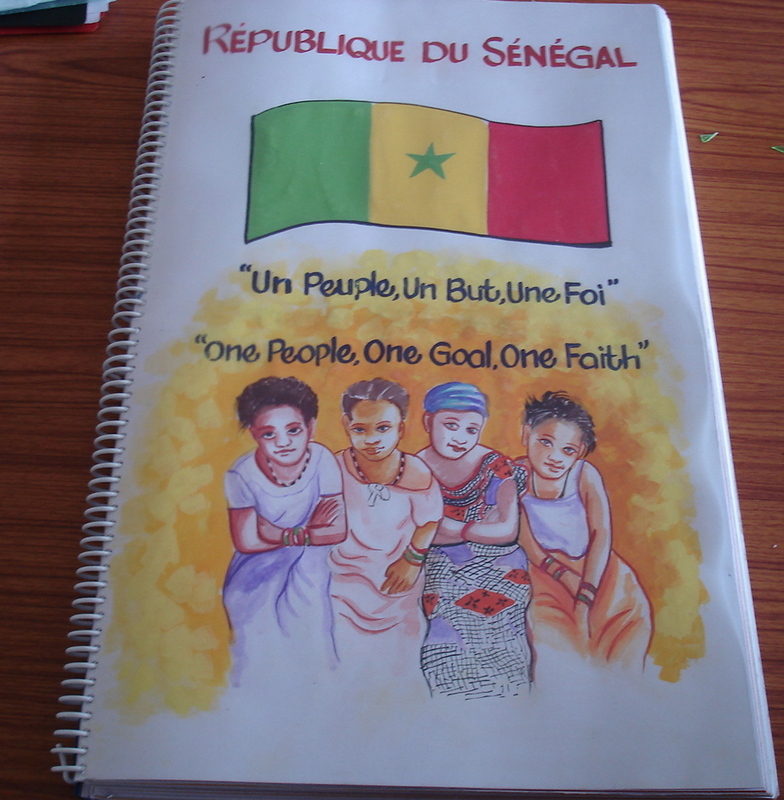 We got the West African Country of Senegal. This had 4 delegates (General Assembly I, General Assembly (Plenary), Human Rights Council and Committee for Crime Prevention and Criminal Justice. In all, there were 10 committees. Each committee is allotted 2 topics, on which they have to discuss, debate, and then finally pass resolutions. I took General Assembly I, whose topics were Multinational Terrorist Groups and Conflict Diamonds. (See the committees and agendas here). We prepared really hard, did loads of internet research. 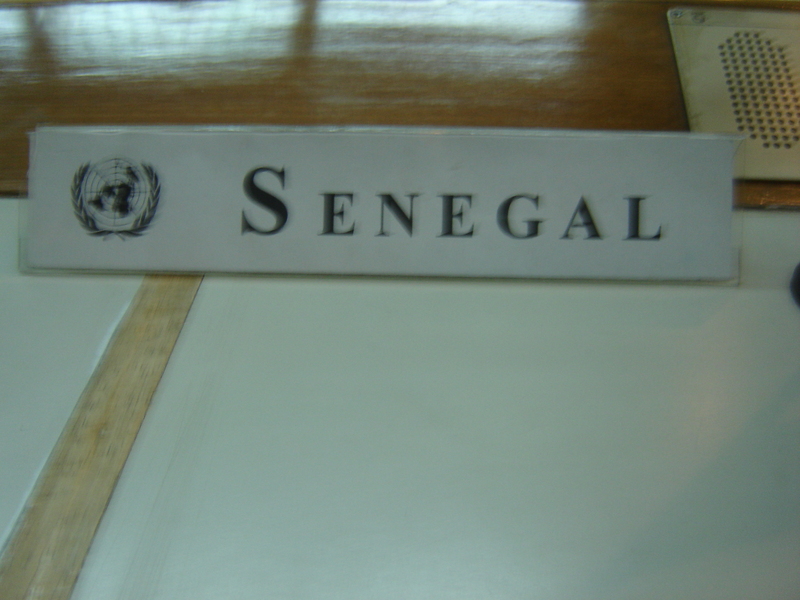 Senegal, in the heart of Western Africa, is in the zone which is most affected by the problem of Conflict Diamonds. I had no idea (because of no past experience) that in a large committee like General Assembly, only 1 topic would be discussed and thus prepared both extensively (Later, only Multinational Terrorist Groups was discussed, after a vote was held as to which topic should be set on agenda first). You have to master the rules, make position papers, prepare speeches, read up extensively and a big fat Country Profile also has to be submitted. There are voting procedures, moderated and unmoderated caucuses. We stayed back after school, met on Sundays and finally D-Day came on 22nd. We left at around 9-30 AM but the final committee sessions started only around 3 PM. The Inauguration Ceremony was presided over by Dr APJ Abdul Kalam. He gave a really great speech (which you can read here). The Stein Auditorium was jam-packed and everybody was looking for good seats. After that, there was lunch, which was good. Then the committee sessions started, and there was a roll call, followed by a motion for setting the agenda for the day and then finally the speaker’s list was opened. Day 1 ended at around 5 PM. Day 2, the sessions started at around 8-30 AM and went on till around 4-30 PM. It did get a bit boring in between, but there was a crisis situation which was introduced in between, on which we had to give solutions and then pass a resolution. My committee was all about International Security and Disarmament issues, so we got a topic related to that. Day 3 – everyone was in a mood to enjoy and have fun. Then there was the closing ceremony and the Prize Distribution. All in all, it was a good experience, but it could have been conducted in a better manner (especially my committee, which had 134 delegates – the largest of them all). Though we did not win anything (we did not expect to! ), it was a good to have participated. I can go on and on about this, but I will leave it here – I dont feel like writing anymore abt this, becoz its really boring! 1. Name the major company that rejected a takeover bid by Microsoft recently. 2. Name the latest two graphic cards launched by NVIDIA. 3. (*)The Intel India team in Bangalore recently designed a 6 core processor to be used in servers. What was this processor named? 4. Which operating system is the successor to Windows Vista, to be launched in 2009? 5. What resolution is referred to as “Full HD”? 6. (*)HP is the owner of which Gaming PC manufacturer? 7. World’s most photorealistic game. 8. Which company uses the tagline “Yours is here”? 9. (*)What is the codename of Windows Mobile 7? 10. All present graphic cards use which port on the motherboard? 11. Which free internet radio service is promoted by Winamp? 12. Which program is called the “Poor Man’s Photoshop”? 14. Our friend Doug showed off his invention in 1968, in the Joint Computer Conference in San Francisco. It’s a pivotal part of computers these days. Name the invention. 15. Who’s called “Father of Visual Basic”? 18. How many Gigabytes are there in a Terabyte? 19. Sun Microsystems and Intel have their headquarters at a common location. Name this place. 21. What is one unit of mouse movement called? 22. (*)Which is the successor to the current Leopard version of Mac OSX? 23. Name a desi internet search engine. 25. Name the thinnest notebook in the world. Thanks to Pulkit for this paper. It was an easy prelims set, mostly on basic current affairs stuff. We qualified for the finals and came 2nd. Here are the downloads (Quiz was totally copied from Past Exun archives) for Dynamix 2008 – With Solutions. The finals of the Quiz were really bad and I just hope next year this fest is better! Ans: “This is not what you think it is”. The encryption system used here is ROT-8, not ROT-13. 2. What is the NASDAQ stock ticker symbol for Sun Microsystems? 3. Of which US-based media organization is Microsoft the part owner of? 4. Who is the creator of eBay? 6. Digit magazine is owned by which company? to run Wikipedia and many other similar wikis. 9. For which operating system was Microsoft Office first released? 10. * Which company makes the processor for the Apple iPhone? 11. * What is the name of Microsoft’s diagram and flowcharting software? 12. Name the GUI used on the OLPC XO laptop. developers. What is that product? 14. * What was Yahoo! Widgets earlier known as? Water are different varieties of what? 17. Name Mozilla Labs’ new instant messaging project. 18. What do you get when you multiply six by nine? The sad part was we missed qualifying for the finals of this Quiz because we did not write 42 as the answer to the 18th question 😦 and then lost out to DPS Dwarka in the tie-breaker. Also made another big blunder, wrote Mac OS X instead of Mac OS for the 9th question and paid a heavy price. But Ankur did a great job for the finals (which was real tough!) and I enjoyed the quiz as audience.